Additional groundbreaking gaming partnerships to provide academic, social, wellness, and career opportunities for students via a new leading-edge esports Community Center. 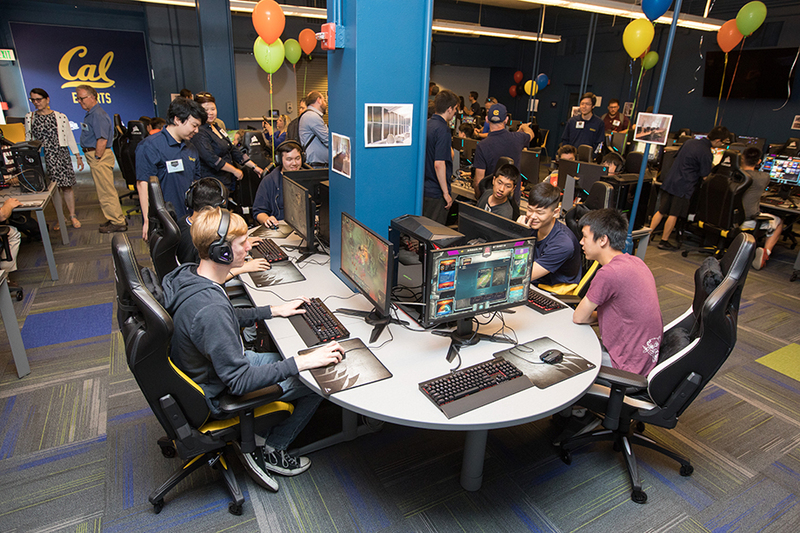 SAN FRANCISCO – August 16, 2018 – The University of California, Berkeley opens its new, leading-edge esports community center on campus with a ribbon-cutting ceremony on August 18, and, as part of its campus gaming expansion, announced it is partnering with industry leaders NVIDIA and CORSAIR to provide funding and equipment to support the new center. The new Cal Esports Community Center will open officially on Monday, August 27, 2018, and act as a hub for the student gaming community. Located at Foothill Residential Center, a historically under-scheduled side of campus, the multipurpose gaming space will be home to the Cal Esports competitive teams, open to all levels of casual gamers, and host ongoing programs events and activities that focus on community, social good, wellness and lifelong learning. UC Berkeley students, staff and faculty will be able to use the center by creating an account to a secured ggLeap portal and then purchasing blocks of time using their student/staff ID. Plans are for the Cal Esports Community Center to be staffed by students, with the goal of being open seven days a week. NVIDIA GeForce is the world’s largest gaming platform, with more than 200 million gamers. CORSAIR is one of the world’s leading providers of enthusiast-grade PC components and peripherals. The companies will outfit the new community center with financial support, state-of-the-art gaming desktop computers, monitors and other equipment. The Cal Esports Gaming Expo powered by NVIDIA, which takes place at the campus Caltopia event, August 19 and 20, will feature both companies as well as other gaming corporations. Earlier this year, UC Berkeley announced partnerships with gaming industry leaders NRG Esports, a San Francisco-based esports organization competing in eight professional video game leagues — including SF Shock — and Riot Games, developer of League of Legends, the world’s most-played PC game. The University will launch the inaugural League of Legends Intramural Esports League this fall, as well as new scholarships for student-athletes playing on the Cal Esports League of Legends competitive team. The total value of all partnerships so far exceeds $1 million over three years. In addition to competitive gaming, all of the partnerships will sponsor a mindfulness, health and wellness program for gamers, as well as a Women in Gaming Initiative to create a gateway for more female gamers to play more games, with more confidence. The partnerships also provide support for educational and professional development programs for esports student athletes, including a community innovation lab, exploring tie-ins to for-credit courses, connections to a professional, competitive team for students interested in becoming professional players, industry internships and job fairs in association with the campus Career Center, and an alumni gaming chapter for lifelong learning opportunities. Media Event RSVP: To attend the Saturday, August 18, 2018 Esports Community Center ribbon-cutting ceremony from 3:00 - 4:30 pm at the UC Berkeley campus, please RSVP to adam.ratliff@berkeley.edu. The University of California, Berkeley is the world’s premier public university dedicated to excellence in teaching, research, and public service. The University of California was chartered in 1868 and its flagship campus in Berkeley, on the San Francisco Bay, now has more than 1,500 full-time and 500 part-time faculty members dispersed among more than 130 academic departments and more than 80 interdisciplinary research units. CORSAIR is a world leader in providing high-performance PC peripherals and components to gamers, enthusiasts and eSports athletes. Founded in 1994, CORSAIR has won thousands of awards for its products including mechanical keyboards, precision gaming mice, wireless headsets, high-performance components that gamers use to build gaming PCs, and the CORSAIR ONE fully-integrated gaming PC. Since inventing the graphics processing unit (GPU) in 1999, NVIDIA has set new standards in visual computing and provided breakthroughs in parallel processing that make supercomputing inexpensive, energy efficient and widely accessible. The company holds more than 1,100 US patents, including ones covering designs and insights fundamental to modern computing. Yugina Yun, CORSAIR COMPONENTS, Inc.